MPs have taken part in a second round of votes on alternative proposals to Theresa May's Brexit deal. 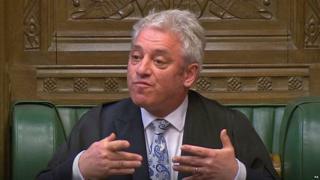 None of the four options chosen by the Speaker, John Bercow, were backed outright by MPs. The first series of "indicative votes" on various options was first held last week, on 27 March. None of MPs' eight proposals secured a majority then either. The House of Commons is attempting to find a strategy that can gain majority support after the prime minister's plans were rejected on three occasions - so far. This option commits the government to negotiating "a permanent and comprehensive UK-wide customs union with the EU" as part of any Brexit deal. But it would prevent the UK striking independent trade deals with other countries, and has previously been ruled out by Mrs May. A version of this proposal received the most support in the first round, falling just six votes short of a majority. This proposal would mean joining the European Free Trade Association and European Economic Area, with countries such as Norway. It means the UK would remain part of the EU single market and would retain freedom of movement, so British citizens would keep the right to live and work in the EU and vice-versa. In the last round, 188 MPs voted for this plan and 283 voted against. This gives the public a vote to approve any Brexit deal passed by Parliament, before it can be implemented. Tabled last time by Labour former minister Dame Margaret Beckett, this option won the highest number of votes, with 268 MPs for and 295 against. This option offers a series of steps to prevent the UK leaving the EU without a deal. First, it requires the government to seek an extension if a deal has not been agreed two days before the deadline for leaving. If the EU does not agree to an extension, on the day before the UK was due to leave, MPs would be asked to choose between a no-deal Brexit or revoking Article 50 to stop Brexit altogether. In the event of revoking Article 50, an inquiry would be held to find out what type of future relationship with the EU could command majority support in the UK and be acceptable to Brussels. MPs previously voted against a proposal to cancel Brexit by Joanna Cherry, but have not considered this plan before. The following four motions were rejected by Mr Bercow. This proposal aimed to commit the UK to leave the EU on 22 May with an amendment to Prime Minister Theresa May's withdrawal agreement. That would allow the UK to exit the so-called Irish backstop whenever it wants, without the EU's permission. The backstop is an insurance policy designed to keep an open border between Northern Ireland and the Irish Republic "under all circumstances", if the UK and EU do not manage to agree a permanent trade relationship in time. Many MPs fear that it could mean the UK is tied to EU rules for years, while the Democratic Unionist Party has voted against it because it would mean Northern Ireland was treated differently from the rest of the UK. This was a new motion, which was not considered by MPs on 27 March. But the EU has said that the backstop is not up for renegotiation. This motion asked MPs to support the UK leaving the EU without a deal on 12 April, if they have not agreed to support the prime minister's withdrawal agreement by then. 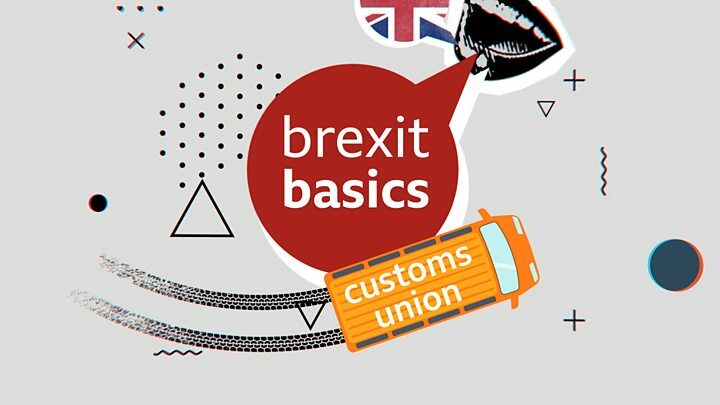 If the UK did leave the EU with no deal, it would mean initially trading on World Trade Organisation (WTO) terms, which could mean tariffs on certain goods and extra checks on UK goods entering the EU. On 27 March, a similar motion was backed by 160 MPs, but opposed by 400. This was another proposal for the public to vote on the future of Brexit, but in this case it would only happen if the UK was otherwise going to leave the EU without a deal. MPs have not voted on this motion before. This motion proposes that the UK rejoins the European Free Trade Association as soon as possible, meaning the UK stays in the single market. It also requires negotiations with the EU over "additional protocols" to resolve the issue of the Irish border and agri-food trade.